There is no reason to think why there won't be any earth-sized planets orbiting other stars. 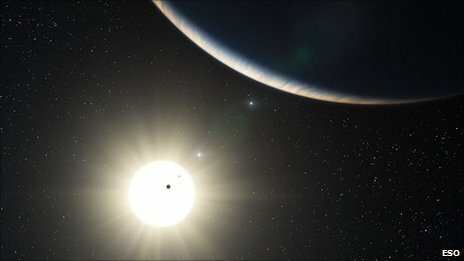 The detection techniques so far have been sensitive to the detection of large planets usually orbiting close to the parent star. We now have the detection of a solar system containing at least 5 Neptune-size planets - and may be two more planets, with at least one comparable to the size of the Earth (about 1.4 times the mass of the Earth). This system is located about 127 light years away and the host star is similar to the Sun. If you want to impress your friends, the name of the host star is HD 10180 (you can find details of the star and the planets if you click on the link to the name of the star). Yes, this is very cool - especially if the detection of the smaller planet(s) is confirmed. However, couple of cautionary notes: This planetary system, despite all the planets, is quite different than our own solar system. The five Neptune-sized planets are all located within the distance of the orbit of Mars - and that makes it quite a bit crowded than the place we live in. Second, presence of the smaller planet(s) has not been confirmed yet (the detection technique does not involve images - rather, the presence of the planets is inferred from the slight wobble of the parent star - and model-fits to this wobble pattern. This is a very successful method of detecting planets, but as you can imagine, it also gets hard to infer the presence of small planets in a multi-planet system). And even if the detection of earth-size is confirmed, the planet may not be much like our own Earth as it is expected to be orbiting really really close to its sun - with a period of only 1.2 Earth-days! (For comparison, Mercury takes 88 days to around the Sun). Nevertheless, we are getting closer to detecting earth-like planets. If you want to keep track of the number of extrasolar planets, you should check out The Extrasolar Planets Encyclopedia (488 planets from their count) and Planet Quest (473 planets around 402 stars from their count). In fact, download this cool widget that will let you keep track of the count just like your computer clock and weather. I read this cool story on BBC yesterday. Why is the number of planets different according to NASA and according to the Encyclopedia? You have emphasised a lot on size of the planets. Does size really matter? I mean for a planet to be habitable by say, human beings, it does not have to be of the same size or close to the size of Earth. Or am I wrong in thinking so? I always thought it is the Goldilocks zone that is important. This makes me wonder whether Jupiter sized planets can be accomodated within the Goldilocks zone. Does the size of a planet have a co-relation with its distance from the sun? I wish we know heaps more about these planets. They look tantalizingly close. PS. Sorry that I miss-spelled your name in my earlier comment. "Why is the number of planets different according to NASA and according to the Encyclopedia? " The difference isn't that much - and I think the NASA counts planets only when they are confirmed AND published in a paper. So they lag a bit behind, but perhaps are ultimately more accurate. "You have emphasised a lot on size of the planets. Does size really matter?" Excellent point: Actually here it does - and smaller the better (though not too small). Here is the reason: We are searching for rocky planets - because we know that life can exist on rocky planets (we have a confirmed example of 1 and perhaps Mars). Large planets, however, are made up of mostly gases (hydrogen, helium, nitrogen, methane, etc). In fact that is the only way to make a large planet - as the ingredients for the rocky planets (for example, silicates) are not that abundant in the nebulae from which planets form from. So that is the reason why we are looking for smaller planets. Now, it is quite likely that there are moons around these large planets and that those are rocky and may have life on them. But as you can imagine those are even harder to detect at this time. "I always thought it is the Goldilocks zone that is important." Oh - yes, that is still of primary importance. So first we have to find rocky planets - and then rocky planets in Goldilocks zone. By the way, now we also think that there is a Goldilocks zone around large planets - such as around Jupiter (Europa for example has a liquid water ocean). "Does the size of a planet have a co-relation with its distance from the sun?" Yes I heard that SETI is focussing on Europa. And even Titan? But, aren't we searching for a needle in a haystack? Its a pity that we do not have even more hi-fi technology. "Yes I heard that SETI is focussing on Europa"
Not SETI - as intelligence is quite unlikely on Europa (unless you believe Arthur C Clarke's "2010"). However, because of the liquid water ocean, life is quite possible (probably microbial only). Well, NASA and SETI are almost synonymous. :) But, I got your point. "Well, NASA and SETI are almost synonymous. :) "
Actually no - they are very different. In fact, SETI (Search for Extraterrestrial Intelligence) is not even funded by NASA (the US govt. stopped its funding in 1993). SETI is mostly funded privately - though some funds for astrobiology do come from grants from NASA. NASA on the other hand is involved with the human space program, the robotic exploration of the solar system, as well as with the satellites - including observatories such as the Hubble Space Telescope and Spitzer Infrared Space Telescope. So SETI used to be a tiny tiny part of NASA - but now it is not even that. Some of the NASA programs do affect our thinking about life elsewhere in the universe. For example, the detection of extrasolar planets impact this - and much of it is being done by NASA or via grants supported by NASA or the National Science Foundation (NSF). Thanks for the clarification. I actually thought SETI is still a part of NASA.